Finally, after months of toiling, I have an Indian callsign, VU3DCY. Thanks to the hams at the National Institute of Amateur Radio (NIAR) (OM Ram Mohan, VU2MYH and OM Jose Jacob, VU2JOS) and my dear friend, Sanjay Nekkanti, VU3ISS/AB3OE for working on this. I have been dabbling into Shortwave (SW) radio on and off from the time I bought a Grundig radio while studying at GW. When I bought the ICOM IC-7000, I sold the Grundig as the ICOM could do SW frequencies but then got into HF on the amateur bands and forgot about SW. This interest in SW was recently kindled when I attended a build session organized by the University of Michigan ham radio club, W8UM, where we built a regenerative radio for the 40 meter band (7 MHz). It was great to turn on the radio and hear SW stations coming through. But my ultimate goal of hearing All India Radio (AIR) still remained elusive. This afternoon I set out to try the regenerative radio again and was looking at the Shortwave schedules at http://shortwaveschedule.com and saw that AIR was transmitting on quite a few frequencies but I was not sure how accurate the times and frequencies were. So I turned to the webpage of fellow ham and friend Jose Jacob, VU2JOS, who has been an avid SWL since the 1970s and maintains a database of AIR transmitting stations, schedules and links to AIR pages. Looking through I found a page with schedules and saw that AIR was transmitting on 11670 KHz from Bangalore with a power of 500KW aimed to service UK and Western Europe region. I ditched the regen radio, turned on my IC-7000 and tuned to 11670 KHz (25 meter band) secretly hoping for the propagation to be in my favor and that I should hear something. Lo and behold I was greeted by some classical Indian music followed by the customary “This is All India Radio”. I was elated!!! I was hearing an Indian station all the way in Michigan being transmitted from Bangalore. That’s a distance of 13,600 km (8450 miles). For me to hear this transmission and considering short-path the signal should be coming over from the north. 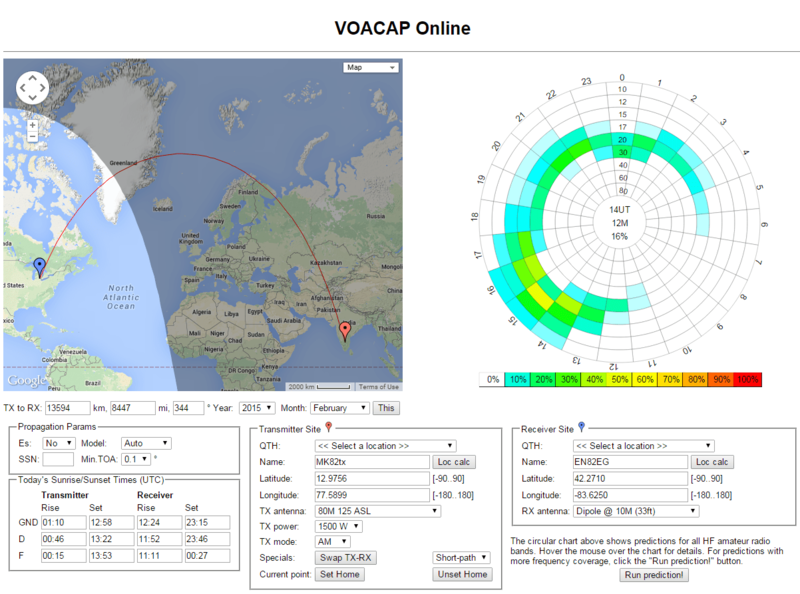 Plugging in some numbers into VOACAP we can in fact see that between 1700 and 2100 UTC the signal reception on 20 meter band ranges between 10% and 40%. Initially, when I started hearing I was getting S4 – S5 on the signal meter and as time passed by the conditions improved to S9. After the Indian classical music couple of songs from the movie Taal were played followed by the News in English and a program on International Mother Language Day. A reception report is on the way to AIR Spectrum Manager and hopefully I will soon see a QSL card. A new open Echolink connected repeater has popped up in Hyderabad, India in the last couple of months operating at a frequency of 145.600 MHz (-) with a call sign of VU2LHR. The repeater is located at Lamakaan in Banjara Hills and is operated by the Lamakaan Amateur Radio Club. Yesterday me and Sanjay, AB3OE went there to attend the Club meeting and check out the repeater system. Although the meeting was canceled we took a look at the antenna system and were surprised to find a very simple setup at a very low height given the fact that I was able to hit the repeater from a distance of 10 km with high rise buildings and a hill in between. I can now talk to fellow hams in Hyderabad from Ann Arbor using Echolink and even try to connect UofM’s W8UM Echolink node to the VU2LHR node. Another experiment to try is to connect 3 Echolink nodes such that me in Ann Arbor, AB3OE in Hyderabad and Sushant Jha, KC2YQI/VE in Edmonton, Canada can talk to each other.